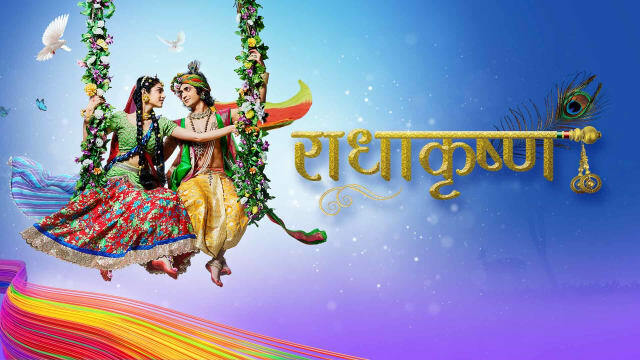 Krishna/Gopadevi reveals that Vyomesh is Vyomasur and came to marry her with a plan. Radha is amused and asks why an asur/monster wants to marry her. Krishna jokes that asurs love to marry beautiful women, but she is not beautiful. Radha gets angry and asks what will they do now. Krishna says they will stop this marriage. Radha asks how. Krishna says when they both unite, they can do anything. On the other side, Jatila informs Vyomesh that she did not see anyone in Baldevi’s room. Vyomesh asks how is it possible, his black magic cannot fail. Jatila asks if he means she is lying and asks him to leave. He walks away. Ayan praises her that she easily fooled Vyomesh. Jatila says her son is so intelligent that he identified her lie, if he knows who is the suspicious woman hiding. Ayan nods no. Jatila says she is Yashoda. Ayan is amused to hear that. Jatila continues that Baldevi and Gopadevi are Balram and Krishna and they hid their mother Yashoda in their room and when they try to send their mother back to Vrindavan in dark, so we will catch them easily with Barsana people’s help. She asks Ayan to gather Barsana people. Balram fixes Yashoda’s bed. Krishna asks if he has lost his mind, they cannot let maiya here. Yahoda emotionally asks if this is the reward e is giving to his maiya for bringing him up. Krishna says she has to return to Vrindavan and bring Vrindavan people here to protect Barsana people as a big mishap will happen to morrow. Yashoda gets tensed hearing that. Balram and Krishna takes Yashoda towards gate when Ayan gathers Barsana people and asks them to find out 3 intruders trying to leave Barsana. They all search intruders. Krishna, Balram, and Yashoda hide nearby. Ayan and Barsana people slip on oiled floor and fall down. Balram praises Krishna that he made arrangements beforehand. Krishna says he did not and realizes Radha did it. Radha enters. Krishna asks her to hold his hand like before and rescue him. They all four run from there right in front of Ayan, and Ayan does not notice them. Radha says if anyone can come here to save Barsana apart from Krishna and Balram, it should be Yashoda aunty. Yashoda shows her face and says she is right. Krishna gives moral gyaan that spider builds its web with its body’s chemical to trap its prey, but it gets trapped in its own web one day and dies; human destroy spider web as it wanted to harm other living being; when bird builds nest and leaves it, human don’t destroy it as it is built to give a life; similarly one has to make right choices for the better future. Precap: Gopadevi turns back to Krishna and asks Radha to punish Krishna and not Gopadevi. She runs behind him and he magically spreads light on land. Vyomasur thinks Krishna and Balram are trying to stop his marriage, he will kill them both. Krishna smiles hearing that.